Recortadora de hilo de 40 V para usar con accesorios EXPAND-IT™ está calificado 4.6 de 5 por 67. Calificado 5 de 5 por haepro de 40V Battery String Trimmer Worth It! 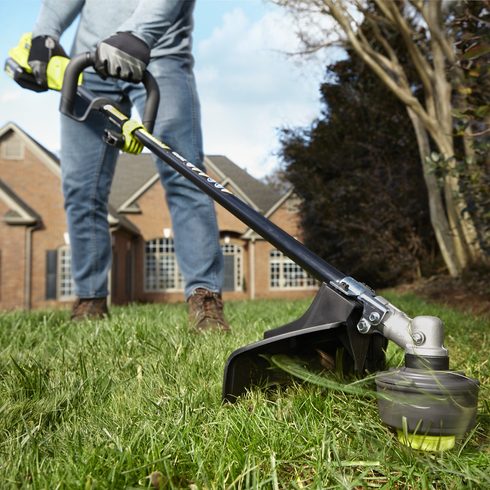 We wanted to stay away from gas if possible for our yard maintenance and this 40V trimmer is part of a complete electric yard maintenance system by Ryobi. The yard trimmer was extremely easy to get going. The power is strong and enough for most weekend warriors. The battery easily lasted through trimming my front yard and is powerful enough to take down some aggressive weeds. Replacing and adjusting the string is easy enough but I recommend tracking down a video on youtube if your not sure how to change it the first time. Next we are getting the 40V lawn mower and then the chainsaw to have more batteries if needed. So far not an issue. Calificado 5 de 5 por Brandonthegardener de More power than expected! I am a small local business trying to evolve away from petroleum based garden/landscape equipmet. I purchased this model because it is attachment capable and uses battery power instead of gas. Batteries are much safer to me because I don’t have to carry gasoline around in my truck, and it’s cleaner for the environment. It is more powerful than I expected, and quiet so it cuts out noise pollution as well. Thus far I am more than satisfied, and would recommend these products for any small business trying to “clean up its act”. Thank you for making this available at a reasonable cost! Calificado 4 de 5 por Bryguy de Upgrade From Previous I bought this about a month ago as an upgrade to the previous 40v expand-it trimmer hoping to have more battery life. This trimmer is a great deal because it is more powerful and lighter as well as comes with a 4ah battery which is plenty for my trimming needs. Exceeds my expectations for being batteries powered. Definitely compares to my neighbors gas trimmer. Calificado 5 de 5 por James6869 de Great features and versatilty We bought ours awhile back. This winter we had a lot of rain which brought up alot of weeds everywhere. The string trimmer does a good job on most weeds and trimming along the bottom of fencing, sidewalks and such. However it won't cut down the heaver weeds with thicker trunks. 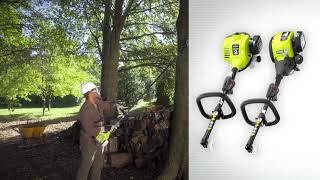 So we purchesed The brush Cutter Attachment. Real easy to switch from the string attachment to the brush attachment. The Brush Attachment does a fantistc job on the heaver weeds. I have even used it to trim suckers off the bottom of some of our trees. 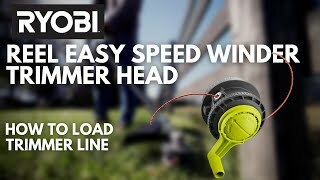 Really a great addition to our 40V EXPAND-IT String Trimmer. Calificado 5 de 5 por vbjedimaster de I'm a Believer So for my entire life I was always told, "Gas is way better." After my 2-cycle trimmer died after less than three years, on top of being tired of mixing gas and oil, pull starts, and gummed carburetors, I made the leap and bought this Ryobi model. I'm definitely impressed. The power in this is better and more reliable than my old gas trimmer, with the half the weight and a third of the noise. Only thing I wish is battery was a little longer, but I'm able to get through my suburban lawn with 1/3 of the battery left. I was able to keep all my attachments as well from the old trimmer as well! Calificado 5 de 5 por Timberlane9 de WOW!! No gas needed. Handled all I needed around the house and some on the farm pond as well. Calificado 5 de 5 por Anthony Orbegozo de Great I bought it a month ago and it works perfect. I really recommend it. GAS-LIKE POWER™ suma versatilidad con la recortadora de hilo 40V EXPAND-IT™ con posibilidad de accesorio. Reunimos todo lo que las personas adoran de nuestra recortadora de hilo más vendida y la mejoramos. Esta recortadora ofrece 10% más de potencia, 50% más de funcionamiento y es 40% más liviana que la versión anterior. 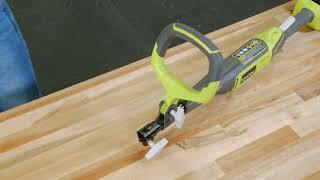 Con su cabezal apto para accesorios, podrá convertir fácilmente esta recortadora en una bordeadora, sopladora, podadora o cultivador inalámbrico, y mucho más con el sistema EXPAND-IT™ de RYOBI . También incluye características profesionales, como el control de velocidad variable para un mejor corte y el cabezal de alimentación REEL-EASY™ para recargar en menos de 60 segundos. Con su ancho de corte ajustable de 13-15", podrá elegir entre extender el tiempo de funcionamiento o expandir la capacidad de corte. La recortadora de hilo EXPAND-IT™ 40V de RYOBI no le hará extrañar la gasolina. Más potencia. Más tiempo de funcionamiento. Más liviana que el modelo anterior. ACCESORIO EXPAND-IT™ PARA SIERRA DE ALTURA DE 10"
Accesorio articulado para cortasetos EXPAND-IT™ de 15"